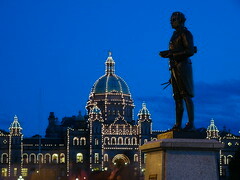 Yesterday we had taken a walk to the harbour of victoria so Gemma could see the Empress Hotel and spotted the Legaslative Legaslative Building. We took a free tour and learnt that to celebrate a visit from the Queen they had installed 3000 lights to the outside of the building that are turned on at night. I thought this would make a great photo so this evening we headed down to the harbour again (15 minute walk). The sun sets at about 9pm here so we left at about 8:10 so we could find a good spot before it got dark. I still have a bit to learn when it comes to dressing appropriately for the Canadian climate as my T-shirt and polar fleece vest left a little lacking once the sun dropped. Gemma, my kind assistant, went and found us coffee while we waited for what seemed an eternity for the lights to come on. I assume who evers duty it is to flick the switch was asleep at their post as they didn’t come on until after 9:30pm. ONce the lights were on, finding a place to clamp my camera to became quite a task. We treied a park seat, a war memorial, a high tension cable supporting a pole but the best photo ended up comming from the camera being perched atop a bin! And who should we find trying to sqeeze his way into the photo. None other than Captain James Cook who has taken up prime position in front of the harbour and the Empress. I’ll have to edit the bird poo out later.